It’s always great to watch someone who loves to do things differently. It’s a rare joy to discover someone who has the courage and ambition to turn away from perceived ‘best-practice’ and pursue a different path. This is what seems to be happening at ONTHEGO SPORTS. The Canberra-based company – which has operated through an online store since launching in 2011 – is doing an apparent about-face and heading into bricks-and-mortar retail. At first, the move appears counter-intuitive. Why would a growing business seek to expand its costs and expand into the one part of retailing that is truly struggling? Well, perhaps it’s because shopping for apparel is still largely a tactile experience and, particularly for new customers, the need to touch and feel fabrics is very much a part of the process of converting browsers to paying customers. That's not all. The shift into physical stores offers another advantage: it puts the brand alongside its competitors in the gym- and active-wear segments. However, ONTHEGO isn’t looking to simply hang the current season’s range on coathangers. Instead, the 'Cutomiz' kiosks will offer buyers the chance to inspect a full collection of styles and colours, and use the touchscreen to fully customise their order. The final part of the concept, and perhaps the part that will see national retailers take on the kiosk, is that the buyer must return to the store to collect the order. “We won’t be shipping to home addresses,” explains Mick. “We want the customer to return to the store. It offers the retailer another opportunity to gain further sales. 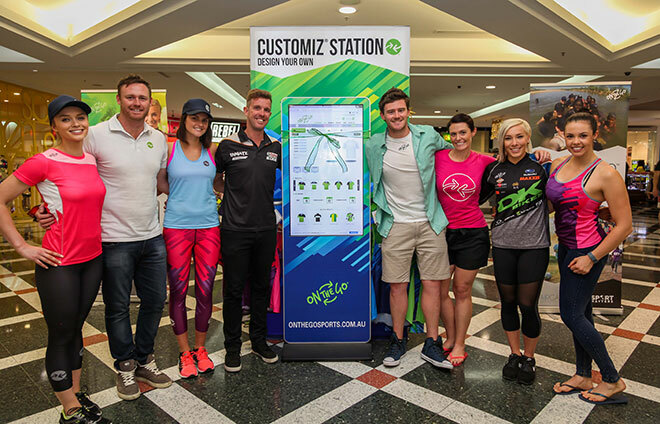 The ‘Customiz Stations’ will roll out through Australian Sports retailers, events and malls in 2016.